Martin Barr has moved into fifth place in the British MX2 Championship. Martin Barr climbed to fifth in the Maxxis British MX2 Championship after round two of the series at the spectacular Canada Heights track in Kent, where he rode the REVO Husqvarna to second overall. It has been a difficult time for the Doagh rider since his massive crash at the opening round at Culham but despite his injuries he is slowly regaining his early season form. Gary Moulds and passenger Niki Adair lead the pack at Desertmartin. In qualifying he was second fastest and in his two races he finished third and second behind double winner Conrad Mewse on the Hitachi KTM. Barr said: “I only did two qualifying laps to protect my hand, so I was pleased with second fastest. I fluffed my start in race one and had a lot of work to do to make it into third but in race two I got a better start and led for the opening laps until I made a big mistake and lost my rhythm. Meanwhile, Carrick’s Graeme Irwin went into Canada Heights leading the MX1 championship and left in third after a disappointing race day, by his standards. The ASA Hitachi KTM reigning British Champion qualified second but could only manage 11th in race one followed by third in race two that gave him fifth position overall behind Buildbase Honda rider Jake Nicholls. 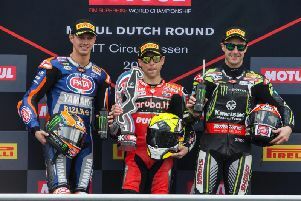 “I was only seven hundredths off pole so I was happy with that but in race one I crashed at turn two and the bike wouldn’t start for about 45 seconds leaving me with a mountain to climb,” he said. “It took a lot of energy to get back to 11th and in race two I just settled for a steady ride into third that gave me fifth overall. Round one of the Maxxis British sidecar championship run by the North Armagh Club produced spills, thrills and brilliant racing at a sun-kissed Desertmartin last Saturday. Stuart Brown with passenger Joe Millard showed why he is an 18-times British Champion as he took the overall victory to lead the championship from fellow English visitors Brett Wilkinson and Dan Chamberlain. Top local pairing on the day was Gary Moulds, last year’s winner, with Niki Adair in the chair. It was between Brown and Wilkinson as to who would take the overall win but in the final race Brown made sure of victory as he forced his way past Wilkinson a lap from home as they crossed the line to win by over five seconds. “Everything that could have gone wrong went wrong,” said winner Brown. For Gary Moulds it was a case of what might have been. “The speed was there but just couldn’t put a race together. “We led two races and really should have been on the podium at the end of the day.